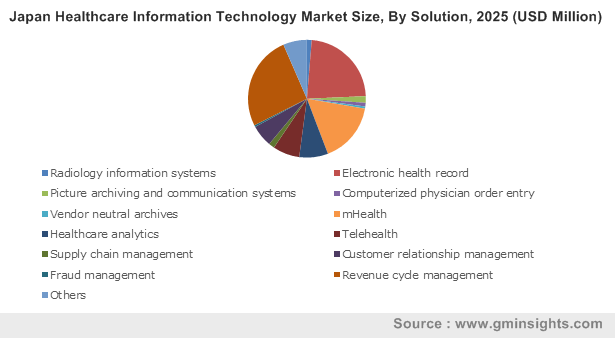 Healthcare Information Technology Market size was valued at USD 163.3 billion in 2018 and is expected to witness approximately 15.4% CAGR from 2019 to 2025. Growing investment for development of healthcare infrastructure in developing nations will be conducive to growth of healthcare IT market. Governments of developing nations are focusing on growth of healthcare services and improving the overall healthcare infrastructure. For instance, between April 2000 and June 2015, Indian healthcare sector received foreign investment worth USD 3.1 billion. Increasing demand for advanced healthcare services and growing investment towards improving healthcare infrastructure will drive healthcare information technology market in the future. Rising adoption of artificial intelligence in healthcare industry will boost healthcare IT market across the forecast timeframe. Artificial intelligence helps in providing practitioner assistance and decision support for tasks such as patient diagnosis and symptom analysis. Artificial intelligence also has potential to determine disease outbreak, accelerate new drug development process and improve overall healthcare outcome. This will propel growth of healthcare IT market over the forecast years. However, issues pertaining to data integrity and safety may restrain healthcare IT market growth. Furthermore, high cost associated with implementation and maintenance of digital health solutions will hinder market growth in the future. Revenue cycle management business is estimated to reach USD 114.5 billion by 2025. Growing demand for health insurance will augment healthcare revenue cycle management business growth over the forthcoming years. Key industry players develop technologically upgraded software, thus increasing its preference amongst the hospitals. Also, development and high preference for big data analytics should positively influence the healthcare revenue cycle management business growth in foreseeable future. Telehealth industry should witness lucrative growth of 19.1% CAGR between 2019 and 2025 owing to increasing awareness about the advantages associated with implementation of telehealth services. Patients can avoid long waiting times for consultation. Also, the cost of availing healthcare services through telehealth is relatively low, that will boost market growth across the future. Increasing funding for telehealth, development in telecommunication infrastructure coupled with rising prevalence of chronic diseases will foster market growth. Healthcare providers market is estimated to reach USD 277.5 billion by 2025. Rising demand for patient care in healthcare facilities owing to increasing chronic diseases and developing healthcare infrastructure across the globe will positively influence adoption of healthcare IT solutions among healthcare providers. Presence of sophisticated infrastructure and skilled resources in healthcare settings will further stimulate healthcare provider market size in the forthcoming years. Healthcare payer market should witness robust growth of 15.6% CAGR across the forecast timeframe. Increasing collaborations, investments and engagement for adoption of healthcare IT solutions will highly impact healthcare payer segment growth. With growing new technologies and substantial investment in digital health start-ups, these payers are considering adoption of technologies that offer greater business value. 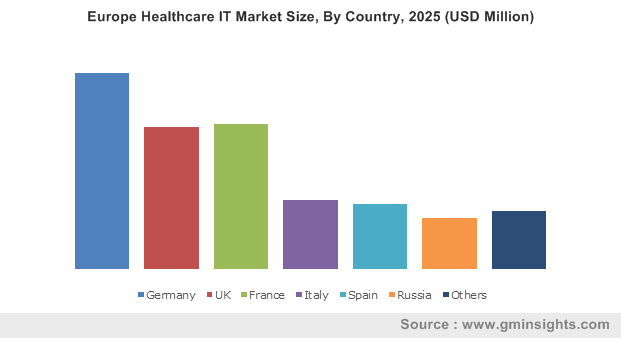 U.S. healthcare IT market is expected to reach USD 141.7 billion by 2025. Increasing funding activities to implement various Healthcare IT platforms will aid growth of U.S. market. The American Recovery and Reinvestment Act (ARRA), 2009 approved significant funding to encourage the vast adoption and “meaningful use” of healthcare IT. In addition, growing awareness about the advantages associated with implementation of information technology in healthcare will boost market growth. Japan market size will show rapid growth of 17.2% CAGR throughout the forecast period. Implementation of electronic medical records for big data analytics in healthcare is one of the major priorities of Japanese government. Presence of well-developed telecommunications infrastructure and growing adoption of technology among the Japanese population should accelerate industry growth. Some of the key players operating in the healthcare IT market space include McKesson Corporation, GE Healthcare, Siemens Healthcare, Oracle Corporation, Hewlett Packard, Athenahealth, Allscripts Healthcare Solutions, eClinicalWorks, Experian Health, Agfa Healthcare, and Carestream Health. Acquisitions, collaborations, partnerships, new product launches and geographic expansion are the most commonly adopted business strategies by healthcare IT industry participants. For instance, in January 2019, Experian Health and Change Healthcare announced collaboration for providing identity management solution to avoid duplication challenges. This collaboration will enable company to deliver an optimal consumer experience, thereby increasing its customer base. Information technology is expected to bring a paradigm shift in the present healthcare system. Development and penetration of artificial intelligence in healthcare industry is anticipated to transform nature of healthcare organizations in the near future. Efficient management of healthcare data is amongst major priorities of healthcare providers; this can be achieved by implementation of information technology in healthcare. 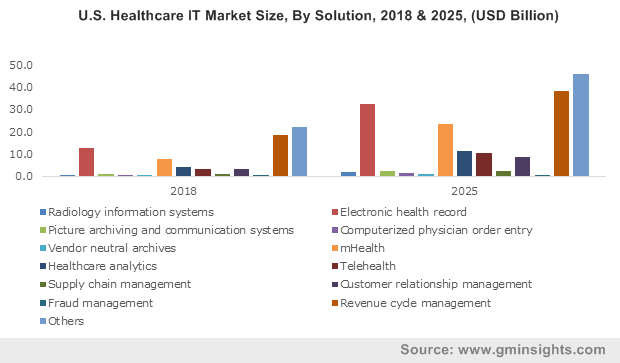 Well-developed IT infrastructure and growing adoption of technological solutions in daily life is conducive to development of healthcare IT market. 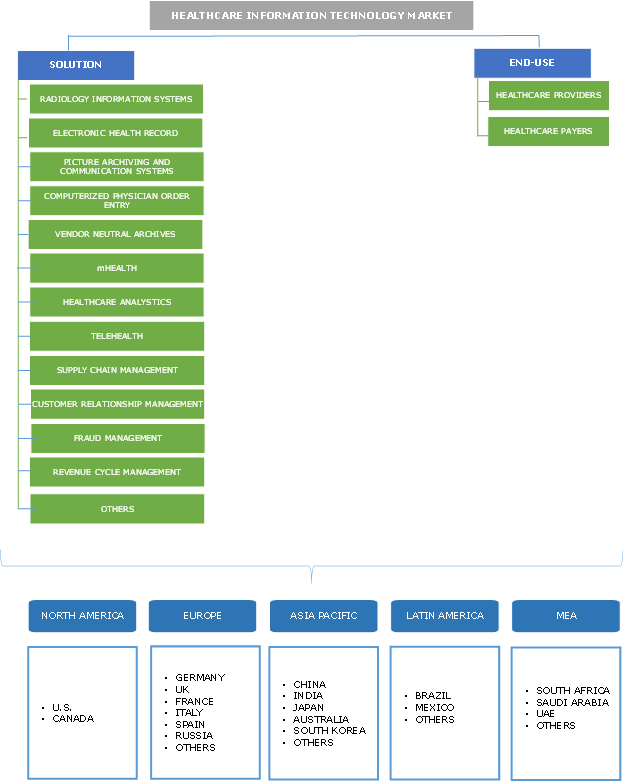 Major players involved in global market are undertaking various strategies to secure larger market share. Moreover, increasing investment in R&D activities will foster development of global market. However, concerns over data integrity and safety are of prime importance and stringent government norms should be implemented to safeguard patient information.